We started Day 9 with a buffet breakfast at the Inn and a walk to town. Jasper is a pretty, but small town. 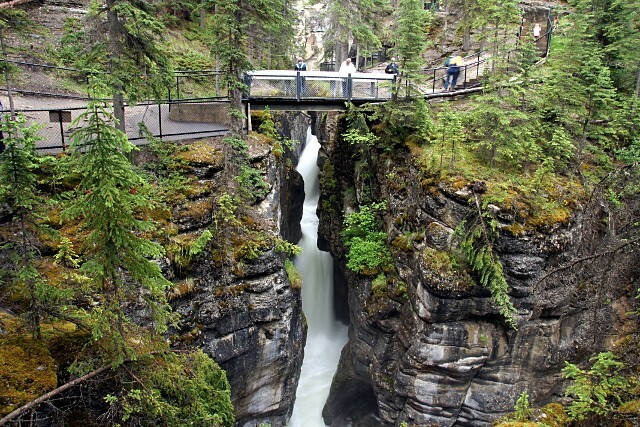 Jasper was founded in 1911 when the Grand Trunk Pacific Railway was built along the Athabaska River to Yellowhead Pass. 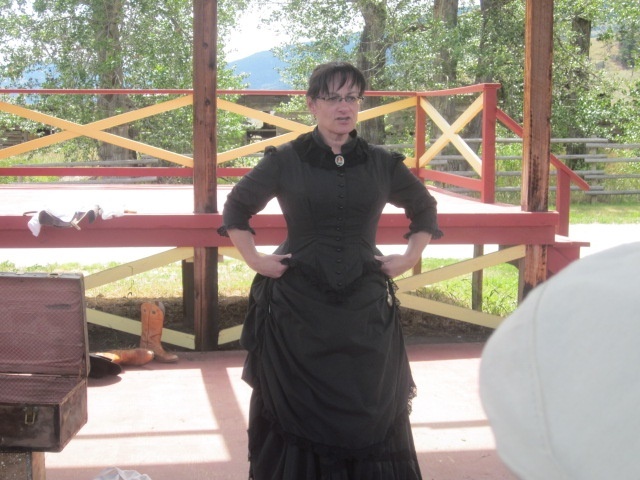 Today Jasper is a quiet, friendly town in a broad valley surrounded by mountains. 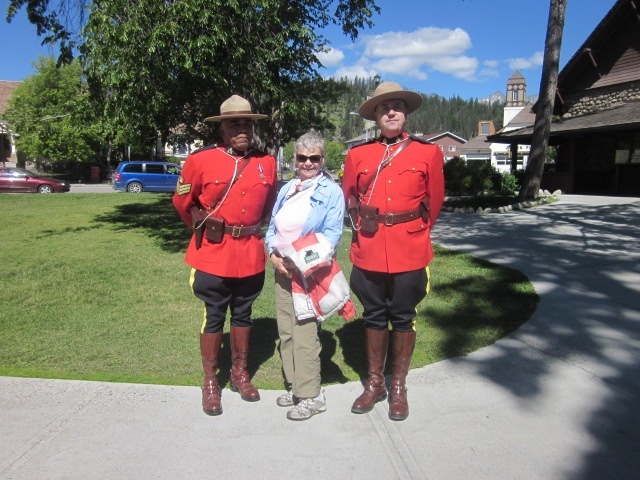 We got to downtown in time to catch part of an Indian Festival and get a picture taken with two Mounties (RCMP). They wanted to take her in for questioning, but I mentioned that she had stuffed cabbage for dinner the previous evening so they let her go. 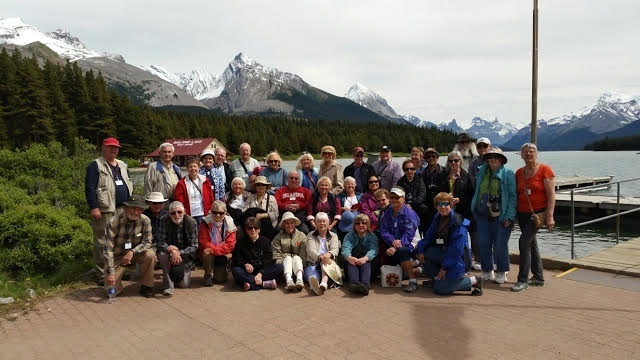 We had a light lunch and gathered with the others for a drive to Lake Maligne for a cruise up the lake and a group photo. 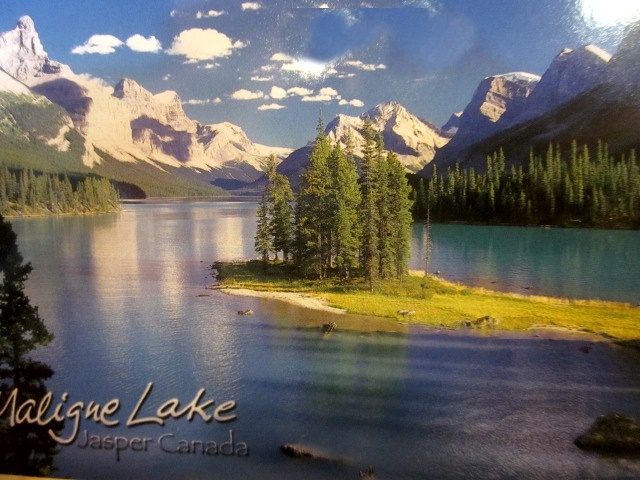 Maligne Lake is in Jasper National Park. It is famed for the color of its water, the surrounding peaks, the three glaciers visible from the lake and Spirit Island, a frequently photographed islet. The lake is located 27 mi south of Jasper. Easily visible from the Maligne Lake Lodge are Leah and Samson Peaks and Mount Paul to the east, and Mounts Charlton, Unwin, Mary Vaux and Llysfran Peak to the south and west. The Charlton, Unwin and Maligne glaciers are visible from the lake. We went a long way up the lake and moored at Spirit Island. Here is an even better view of the peaks mentioned above. Spirit Island enjoys worldwide reputation, and is one of the most famous and most photographed views of the Canadian Rockies. Here we all are for the group picture. That’s Suzanne on the right. There were 40 people in our group and almost all had traveled with GCT or other groups before. Everyone got along real well and were always on time (very important!). With such a big group it’s hard to get to know people well, but those folks we got to know had great stories to tell about their lives and travel adventures. We then returned to Jasper for the evening where Mary Ann and I dined on cheese, cracker, and wine. We then packed for the next days drive to Kamloops, BC. We left Jasper on Day 10 after breakfast and visited several beautiful lakes: Patricia, Pyramid, and Medicine, Here is Patricia Lake with Pyramid Mountain in the background. It was named for Princess Patricia of Connaught, a granddaughter of Queen Victoria. We entered British Colombia and moved our watches back to PST. Our first stop in BC was Mount Robson. Mount Robson is the most prominent mountain in North America‘s Rocky Mountain range; it is also the highest point in the Canadian Rockies at 12,972 ft. Mount Robson is the second highest peak entirely in British Columbia, behind Mount Waddington at 13,186 ft in the Coast Range. The south face of Mount Robson is clearly visible from the Yellowhead Highway (Highway 16), and is one of the most photographed features along this route. This view from the Visitors Center is truly spectacular! This is the Valemont Visitors Center. The reason why the next picture is washed out is because the sun was pouring in those nice big windows. Starting out as small eggs fertilized by male milt (sperm) in a stream bed, they hatch and memorize the water in which they hatched and, after growing a bit, begin their journey downstream towards the ocean. They spend a couple of years in the streams and rivers growing from small alevin to juvenile smolts. At the mouth of the streams and rivers, the smolts school together and ready themselves for the trip out into the ocean. During this time, their bodies change to adapt to the seawater. The young adult salmon then head out to sea and spend several years swimming in the Pacific ocean. Once they have fully grown and matured, they will swim back to their original memorized stream or river where they re-adapt to the fresh water and swim back up the stream to reach their spawning grounds. Once they get back to their natal stream, they breed and lay their eggs. After spawning they generally die within a week, fertilizing the stream and creating a nutrient-rich environment for the new infant salmon that are about to hatch. This is a 47 lb salmon that is ready to breed. It hasn’t eaten since returning from the ocean. Note the hooked nose. That’s the result of its body absorbing itself for food. 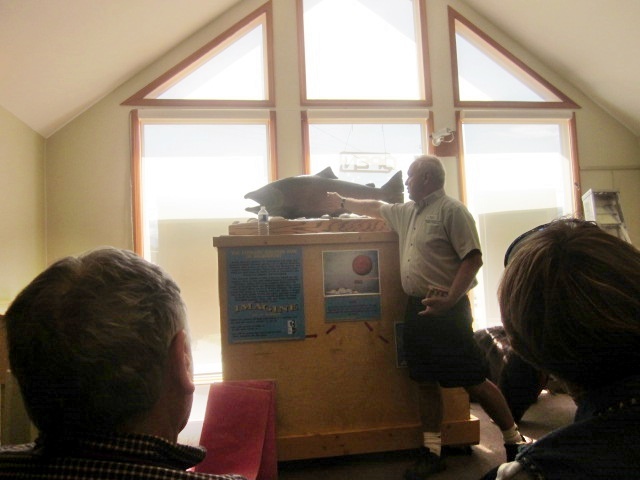 The average size of a Chinook Salmon is: 10-15 lbs, but they can reach up to 135 lbs. 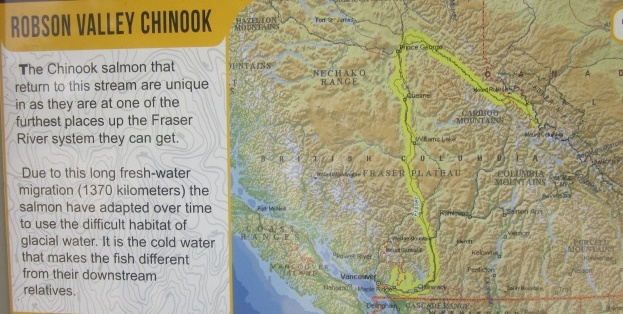 The yellow high lighted line below shows the 820 mile trip that the salmon swim in the Fraser River to get to and from the Pacific Ocean. 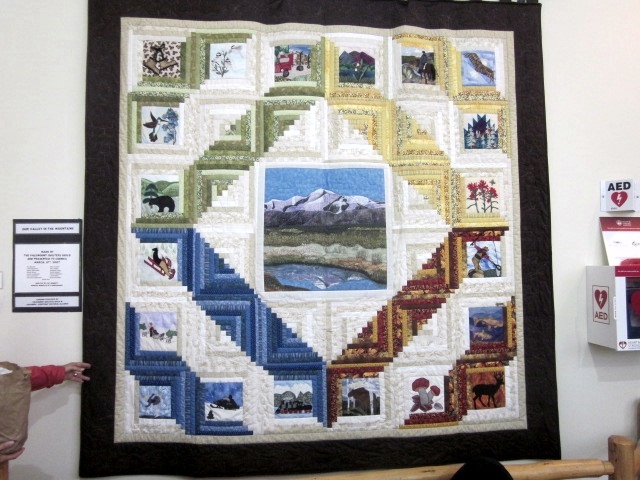 This quilt was in the gift shop. 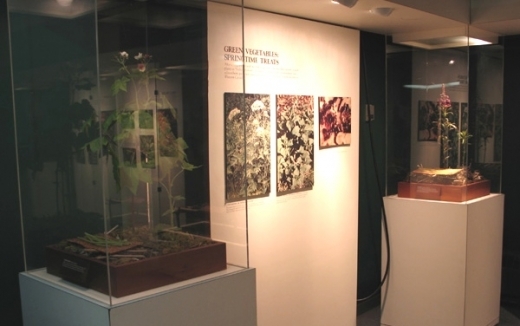 It showed many scenes of BC including a center piece of Mt Robson. Mary Ann is a quilter and she really liked this one. We ended our stay at Valemont by having a picnic lunch (supplied by GCT) next to the river. We continued on to Kamloops through winding mountain road tha Neil navigated safely. Our only stop was in Clearwater for a Dairy Queen snack. We arrived around 5PM at the Kamloops Doubletree Hilton and had a nice dinner (on GCT). After dinner, Mary Ann and I walked around downtown Kamloops. It was Sunday evening and the streets we deserted and all the shops and stores were closed. After a good nights sleep and a nice breakfast at the hotel, we set off to the Secwepemc (pronounced Shuswap) Residential School Museum. The curator told us about the residential school he was forced to attended and the problems it caused to him and others in the school. Sorry, I didn’t write down his name or get his picture. The Kamloops Indian Residential School was part of the Canadian residential school system and one of the 130 schools for First Nations children that operated in Canada between 1874 and 1996. The Kamloops School was opened in 1893 (initially as the Kamloops Industrial School) and continued operation until 1977. Hundreds of Secwepemc children attended the school, often forcibly removed from their homes once attendance became mandatory by law. Children were not allowed to speak their native Secwepemctsin language or practice their own spirituality. The school still stands today. Hundreds of Secwepemc children were removed from their parents and taken to the Kamloops Residential School. Attendance at the school was compulsory by law and parents were threatened with prison if they refused to allow their children to attend. At the school, the children were isolated from cultural influences and indoctrinated with the Catholic religion. The children were forbidden to speak Secwpemctsin and were severely punished when they did speak the language. Attendance at the residential school left devastating effects on Secwepemc children. They lived at the school from September to June and were alienated from family relationships, cultural and spiritual practices and teachings. 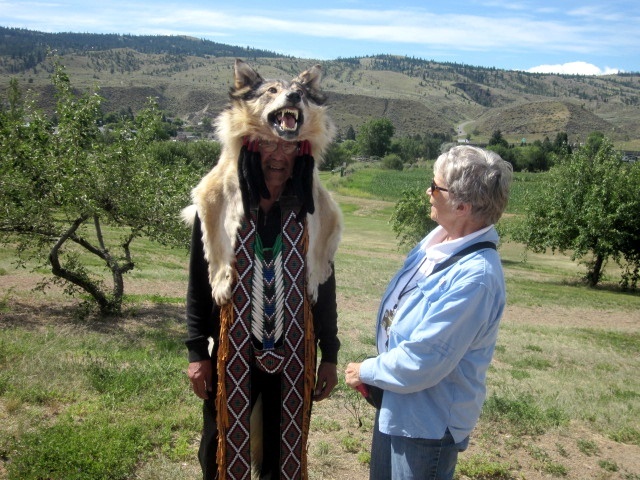 Shame of the Secwepemc culture and language was deeply instilled in the children and when they became adults, they did not pass on the language and culture to their children. Many believed their children would have a better life if they spoke English and assimilated into the Euro Canadian way of life. The effects of the residential school attendance are felt in every Secwepemc community. They include: family dysfunction; loss of culture and spirituality; near extinction of the language; loss of traditional lands and indigenous knowledge and personal and social problems. We left Kamloops and headed to Whistler. 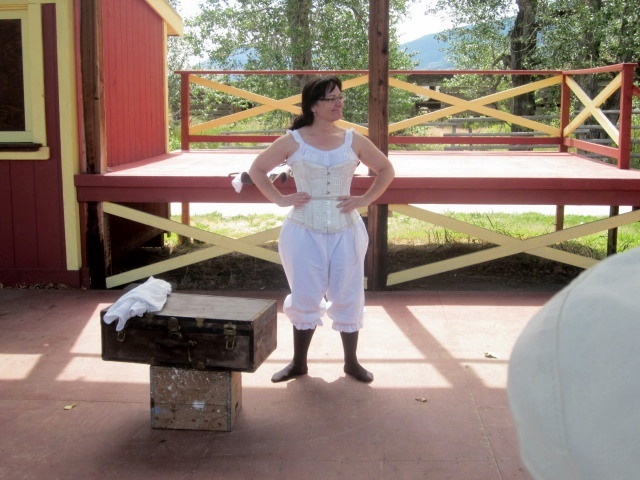 At lunchtime we stopped at the Hat Creek Ranch in Cache Creek, BC. 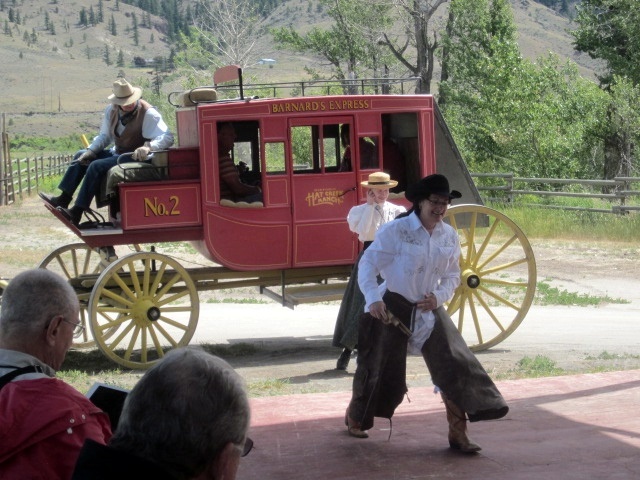 Chris Linton from the ranch came riding in on this stage coach and a cloud of dust! She then proceeded to “un-strip” and ended up as a lady of the times. She was a scream! After that performance we all adjourned to the outdoor dining area for bison burgers or chicken breast (on GCT). Mary Ann and I tried each. The burger was tasty but a bit dry. We reboarded the bus after lunch and settled in for a snooze and the long drive to Whistler.